Little boys can have some really big emotions. While this isn’t necessarily news to parents, responding without shutting down his feelings can be tricky. Early learning researcher and educator, Anthony Semann, told Kinderling Conversation the messages boys learn about their emotions start at a very young age. Having empathy for a crying child is essential, but Anthony says there’s a better way to respond: attunement. “Empathy is, ‘I see the world in the way that you see it’. Attunement is, ‘I feel the world in the way that you feel it’,” explains Anthony. 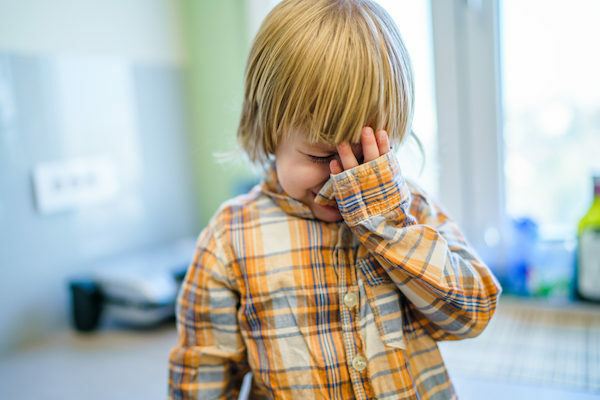 Although crying over broken Weet-Bix might sound silly to you, to a little boy who is experiencing emotions he’s never felt before, it can be A LOT! When parents see young boys cry, they should put aside their empathy and, regardless of the cause of the tears, acknowledge that he’s in pain. “There is absolutely pain; it’s not for me to judge where that pain is coming from or whether it’s worthwhile,” Anthony adds. “So attunement means we enter that space with that child. We look them in the eye, and we say, ‘This must be really sad for you.’ Just kind of connect with that child’s pain because that’s all the child is asking. Yes, talking about emotions and how to handle them is important, but as the saying goes, there’s a time and a place. Luckily, Anthony says kids have pretty good memories and are capable of recalling what happened at a later time. The sooner boys learn about ’emotional literacy’, the sooner they can start linking their emotions with language. But as we know, our feelings are a lot more complicated than just happy and sad. For more on Anthony and the work he does you can visit his website Semann & Slattery.